Apr. 10, 2014 4:00 p.m. The Legion Ladies' Auxiliary Branch #86 Wetaskiwin President Janice Drader-Jamieson presented a cheque for $1,868.39 to Leona Lowe, the Coordinator for Neighbourhood Outreach Wetaskiwin. The Legion Ladies' Auxiliary Branch #86 Wetaskiwin contributed $1,868.39 toward the Neighbourhood Outreach Wetaskiwin (N.O.W.) program. 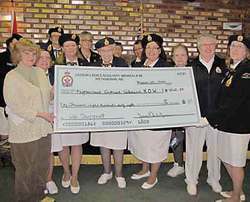 Both the Legion and the Legion Ladies' Auxiliary raise funds which they then distribute to various local organizations whose work benefits the community. Because of all the support, N.O.W. is able to help whoever comes needing help. The original and still basic program is a hearty soup brunch served between 10:30 am and 12:30 pm Monday to Friday. This is accompanied by devotions and prayer. This year, around 26 people are coming most days, but a year ago they were averaging 40 most days, and rarely there is only one. The needs tend to come in spurts. A number of things can leave an individual or part of a family is desperate circumstances, among them the loss of a job or leaving a dangerously abusive relationship. Especially at such times there is a need for all basic necessities, including clothing, household items, furniture etc. Purhaps the most important helps are the listening ears and open hearts. Pe Saskastew, the federal correctional institute at Maskwacis, has indicated a need for Bibles and reading materials, especially recovery related. The remaining community need which N.O.W. is presently unable to meet is for shelter, and meeting that need will require support from all levels of government, especially local and provincial. N.O.W. has truly become a unique community program of many neighbours working together to reach out to neighbours with both a hand out to meet needs and a hand up to a better life.